The Bidwell House, a beautiful example of early New England architecture, opens for the season on May 27, 2010. The oldest part of the building was built in 1750, and additional sections were added in 1790 and 1836. This is a must see for anyone interested in early American architecture. Once you’ve amply admired the old parsonage, take some time to wander through the lovingly maintained grounds – nearly 200-acres of them. 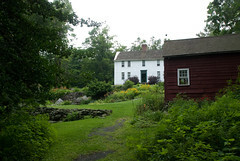 The Bidwell House is about 10 miles south of our Lee Massachusetts bed and breakfast. It’s a quick drive, or a very pleasant bike ride. If you intend to bike, be sure to eat a hearty breakfast!